Today I bought milk in a bag. The type of bag that you'd buy rice or nuts in or another solid food item that definitely wasn't a liquid from a cow. Canada, that's STRANGE. Just so you know. So strange in fact that for my first year in Ontario I stuck to buying normal cartons. This was also due to the fact that the milk-in-a-bag came in four litre quantities, which seems a bit extreme for me and a cat. I contemplated regularly making white russians for group meeting, rather than buying cookies, but decided it would be a hassle to bring in the glasses every week. So I stuck to cartons until it was revealed to me that inside every four litre bag were in fact three 1-and-a-bit litre bags. Why, it was like matryoshka dolls! So I froze two and dumped the third one in a milk jug with the corner snipped off its tip. Magic. In a bag. It is, however, still STRANGE. Canada, don't think I've changed my mind about that. Apparently, the idea of selling milk in a bag was introduced in the UK by the supermarket Waitrose in 2007. Unfortunately it utterly defeated the BBC's technology correspondent and was given up on this April. That is because people thought it was STRANGE. Also, we tried to complicate the issue with a clever container rather than telling people to go buy a pair of scissors. 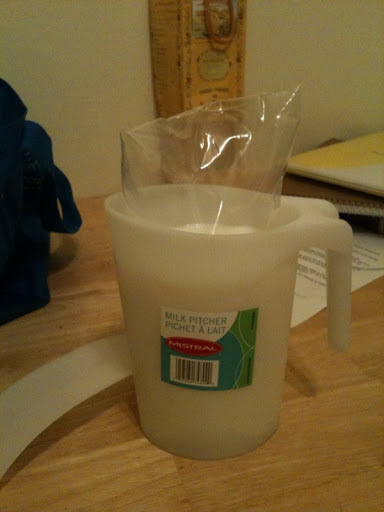 The online environmental magazine, the treehugger.com published two articles concerning milk bags. The first came out when the UK were looking askance at the whole idea in 2008 and had the encouraging title "Milk Bags a Hit in Canada, UK". A bold statement that Sainbury's have since picked up on. However, a recent article from this summer was entitled "Is Drinking Milk From Bags Weird?". Yes. Yes it is. We are pleased you have noticed.